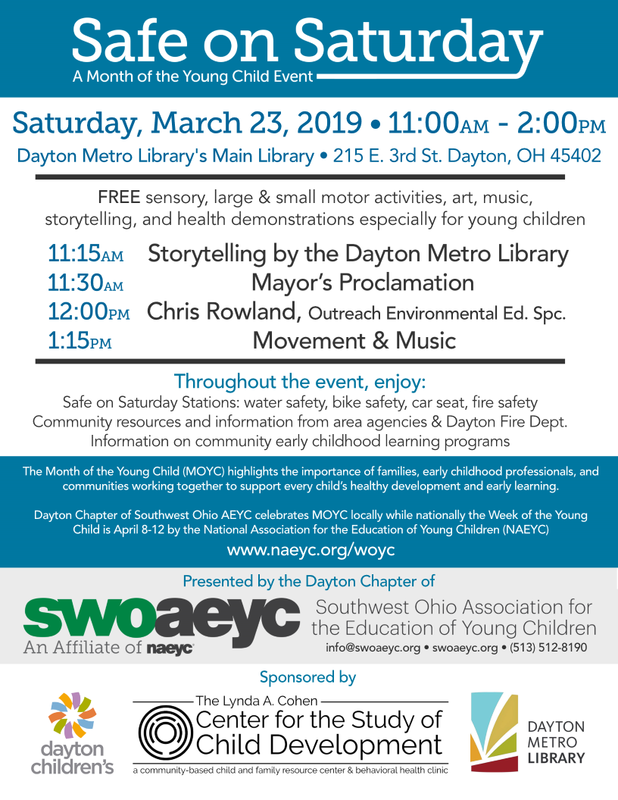 The Southwest Ohio Association for the Education of Young Children (SWOAEYC) Dayton Chapter is presenting a joint venture, with Dayton Children’s Hospital and The Lynda A. Cohen Center for the Study of Child Development, for Safe on Saturday/Month of the Young Child with the Dayton Metro Library. This program will be at the Main Library on Saturday, March 23, 2019 on the first floor in the Eichelberger Forum. The event will be from 11 a.m. – 2 p.m. for children and parents. Safe On Saturday includes free sensory, large & small motor activities, music, storytelling, and a variety of hands-on health & safety activities for children with information for parents. Chris Rowland, Outreach Environmental Education Specialist, will provide entertainment after the Mayor’s Proclamation. 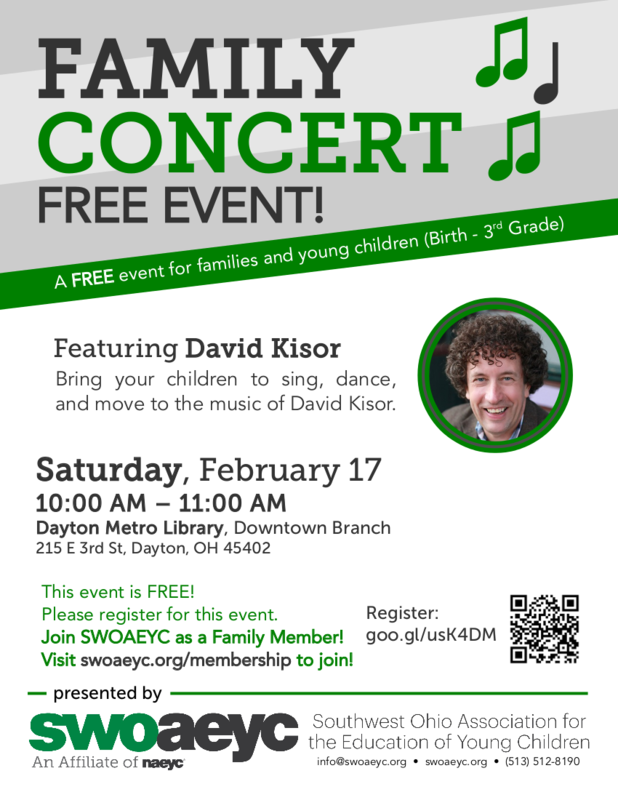 Bring your children to sing, dance, and move to the music of David Kisor. 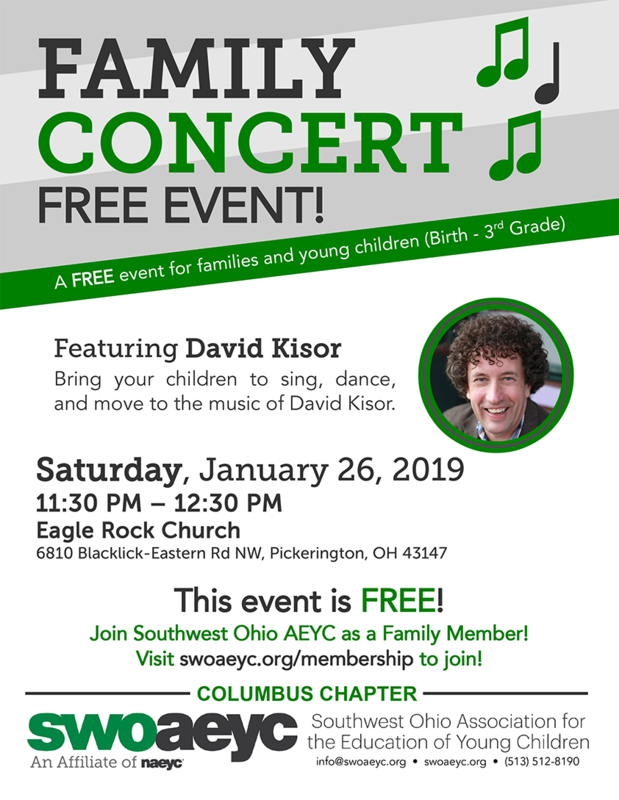 Click here to download the Family Concert flyer! Take a musical journey to a peaceful classroom through conflict resolution, focusing energy in a positive way, taking time to breathe, and preparing the classroom (& ourselves) for peace. SWOAEYC members will receive a FREE digital download card from Growing Sound! Click here to download the workshop flyer! 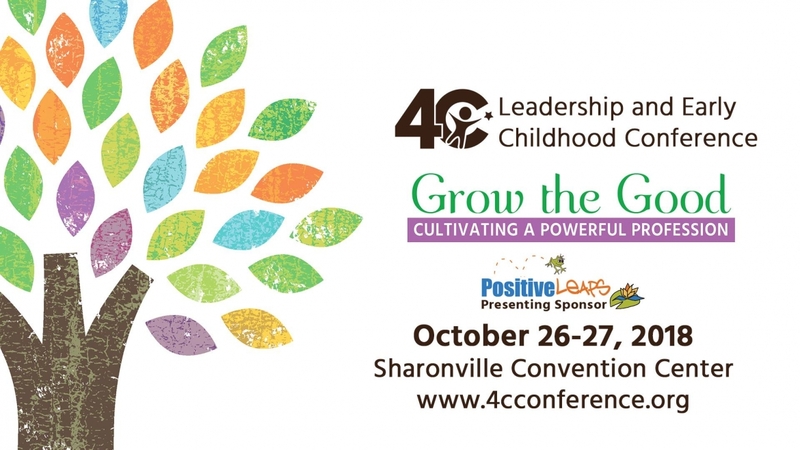 4C Leadership and Early Childhood Conference? Come join SWOAEYC and NAEYC for a conversation on empowering the early childhood profession! Southwest Ohio Association for the Education of Young Children is hosting a conversation to advance the early childhood education profession. Power to the Profession is a national collaboration to define the early childhood profession by establishing a unifying framework for career pathways, knowledge, competencies, qualifications, standards, and compensation. Space is limited. Registration closes September 14. 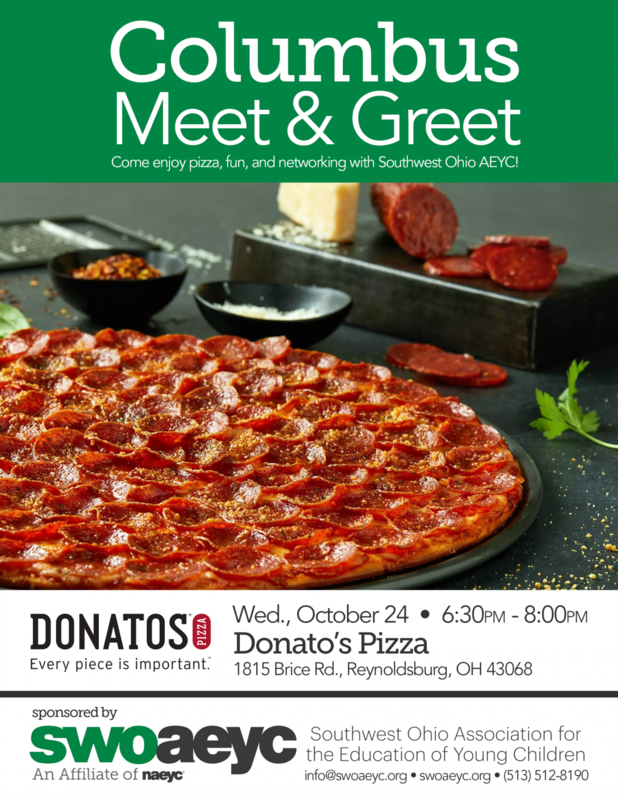 Come enjoy appetizers, fun, and fellowship with Central Ohio early childhood professionals! Show your appreciation for Southwest Ohio early childhood teachers! Teachers who work with young children, from birth through 3rd Grade, play a vital role in our communities. Next week, Southwest Ohio AEYC would like to hear why you appreciate Southwest Ohio early childhood teachers. From May 7-11, Share why you appreciate Southwest Ohio early childhood teachers with our @swoaeyc Twitter account and use the hashtag #SWOhioECE. Print out the template using the link below, write why you appreciate #SWOhioECE teachers, and take a photo of yourself, with a teacher, with a child, or with your colleagues! Looking for gift ideas for an early childhood teacher? Consider the gift of NAEYC membership! Membership starts as low as $30 annually. You could even join with others to purchase a higher level membership! Early childhood professionals love NAEYC membership for the resources, networking, subscriptions, and being part of the premier membership association for early learning (Birth-8) professionals! Be sure to select Southwest Ohio as the state-level affiliate! How about a book from NAEYC? Find books on social and emotional development, extending children's thinking, STEM, and more! NAEYC has books to fit any budget and NAEYC members, including Family members, enjoy a NAEYC Store discount. Early childhood professionals always enjoy more resources and ideas for their classroom! A big thanks to all Southwest Ohio early childhood teachers! We appreciate you! Community resources and information from area agencies & Dayton Fire Dept. The Month of the Young Child (MOYC) highlights the importance of families, early childhood professionals, and communities working together to support every child’s healthy development and early learning. 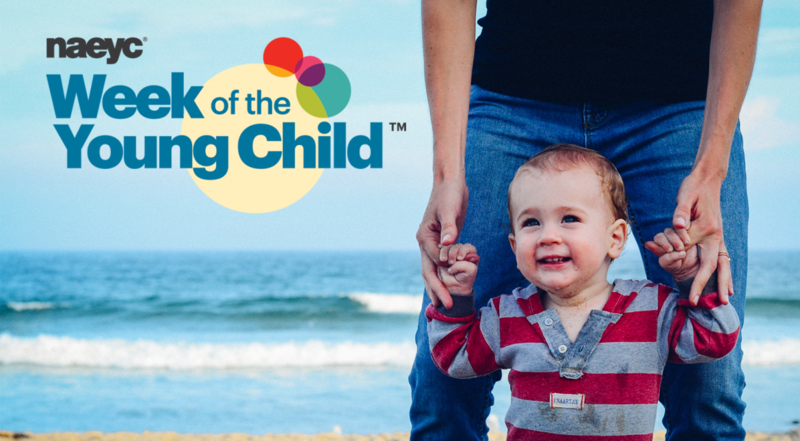 The Week of the Young Child™ is an annual celebration sponsored by the National Association for the Education of Young Children (NAEYC), celebrating early learning, young children, their teachers and families. 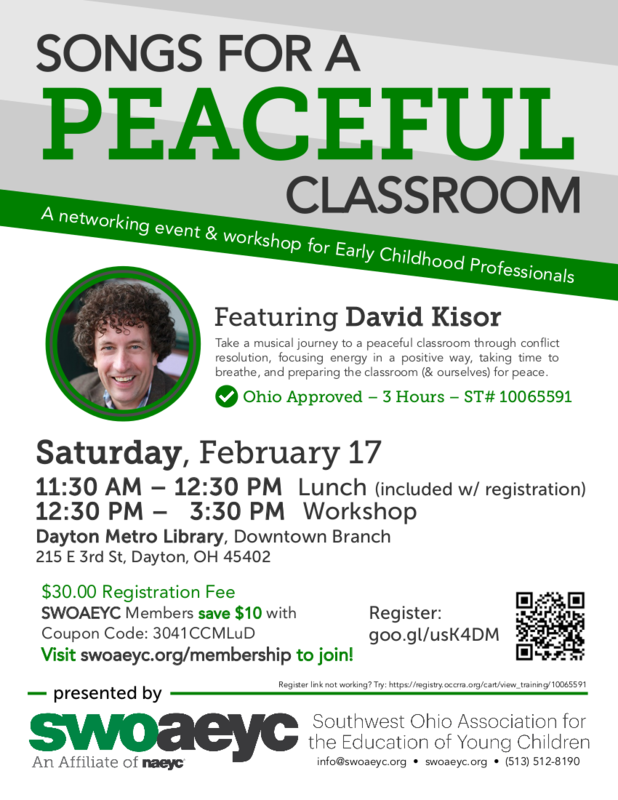 We invite you to join the Southwest Ohio Association for the Education of Young Children as we bring attention to and celebrate childhood. Check out the resources and activities below, and above all enjoy this special time with your child! 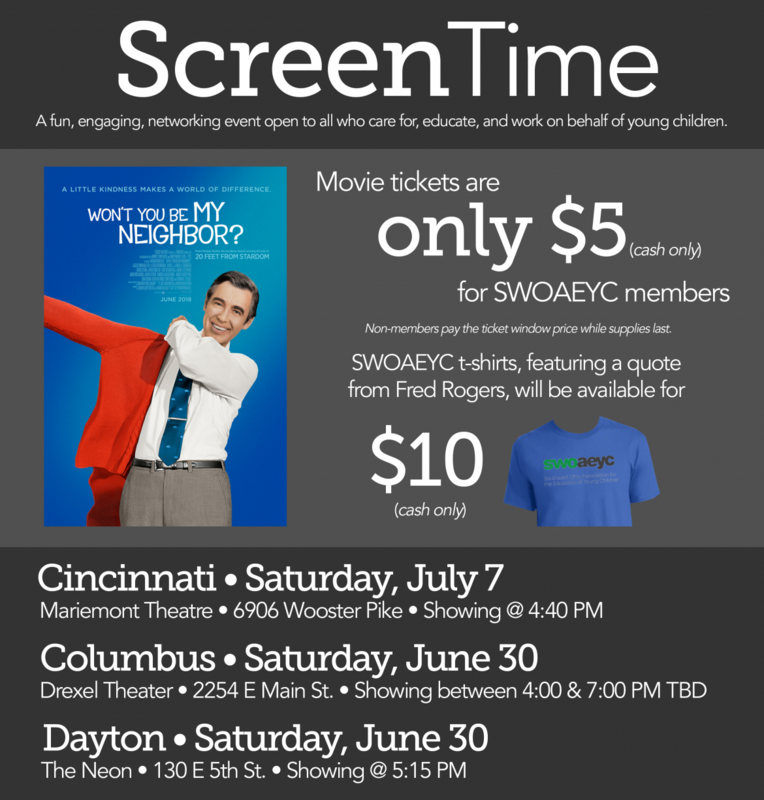 Coming soon to a location near you in Dayton and Columbus! 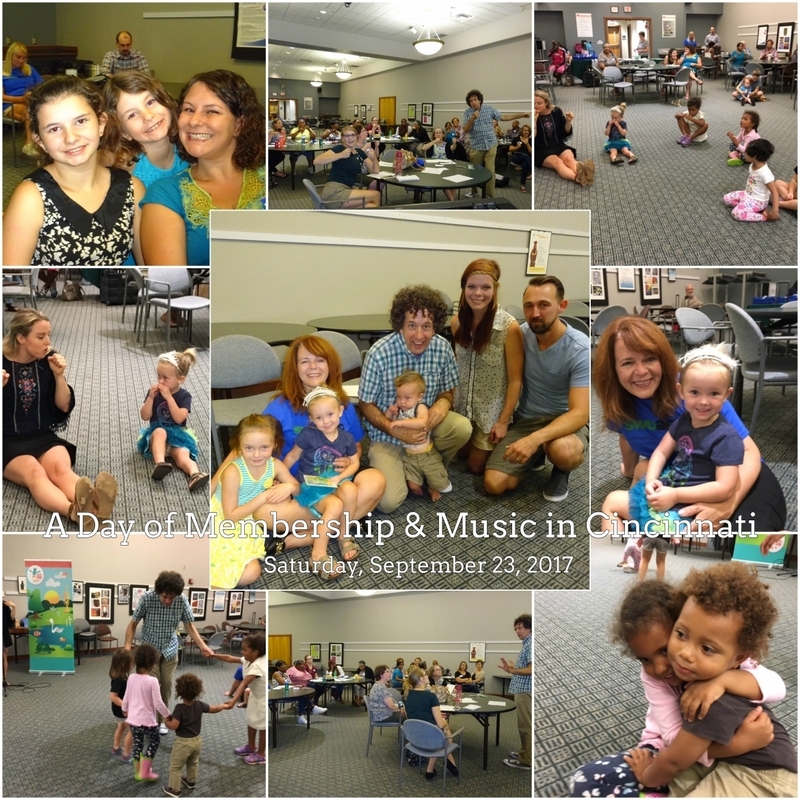 On September 23, parents, children and teachers joined together in a day of Membership and Music. Families came with their children to enjoy the music of David Kisor and Demi Mays. The concert provided the opportunity to share information about the new family membership category. 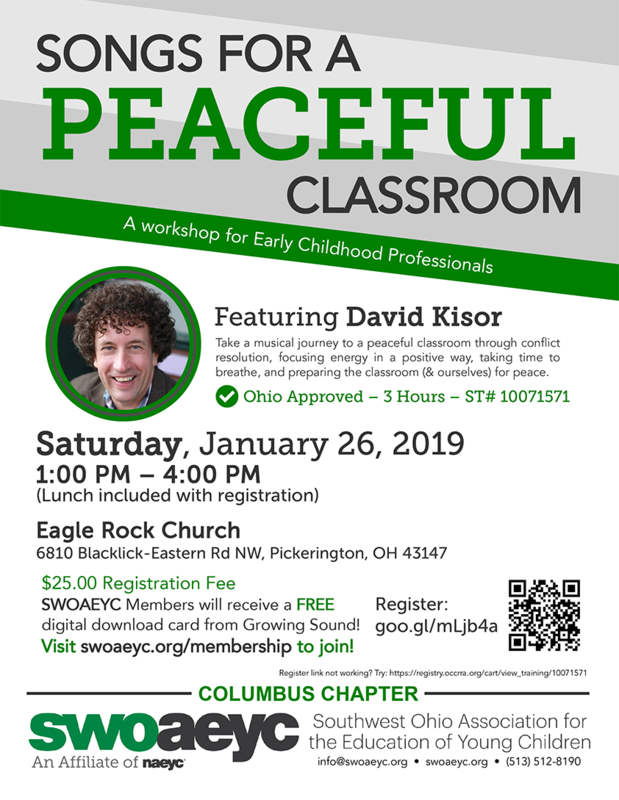 David’s afternoon workshop, Songs for a Peaceful Classroom, was considered “amazing” by participants who linked songs with broader social and emotional themes. Promoting resilience was an over-reaching topic. Participants welcomed songs and strategies to promote peace in the classroom. Here’s a simple take-away for you to use to quiet the children in the classroom. Sit on the floor and take a deep breath. Make a fist with each hand and use your imagination. 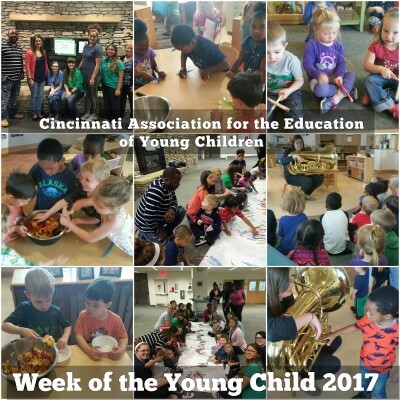 On behalf of SWOAEYC, we wanted to thank all of the teachers, administrators and families who got involved with NAEYC's annual Week of the Young Child! Click HERE to view the conference schedule and to register! The event is free but space is limited. Registration will close on November 20 or when spaces are filled. Register here! An overview of the current landscape of state initiatives to achieve full inclusion of children with disabilities in early care and education programs. A partnership in Warren County resulted in an innovative new practice of providing coaching and support for Head Start teachers to support and include preschool children in their natural environments. An overview of P.L.A.Y. Project and Teaching P.L.A.Y. will be given, along with information about an upcoming collaboration with 4C for Children. 10:30-11:00 Panel discussion and responses to questions from participants. The Xavier University Montessori Lab School is hosting a tour of their program! Come see the Montessori philosophy of education first hand. The philosophy of Montessori education is founded on the respect and reverence of the child. This method of education nurtures and cultivates the unique qualities each child possesses through engaging, meaningful, multi sensory lessons, activities, and materials. Embedded in our teaching practices is inquiry, wonderment, discovery, and joy; children are engaged learners constructing their knowledge and applying it in their lives. As part of our mission we educate a diverse community of learners thereby enriching our experiences and appreciation for one another as well as celebrating our individuality. We are most proud of our students and their demonstrated kindness and respect toward one another. The Xavier Montessori Lab School is nationally and internationally recognized for its standard of Montessori education. The holistic education of the child is also dependent on the partnership with our families. Teachers, parents, administration, and staff collaborate on activities, events, and functions to enrich our students learning and support our spirit of community. The mission of the Xavier University Montessori Lab School is to educate children from many cultures and diverse communities. Our responsibility is to be a demonstration lab school to reflect the philosophy and methods of the Montessori Teacher Education Program at Xavier University. It is our job to develop the whole child by observing, documenting, and assessing.